Head-to-tail cooking may be all the rage with big-name chefs these days, but generally, they’re not talking about vermin. 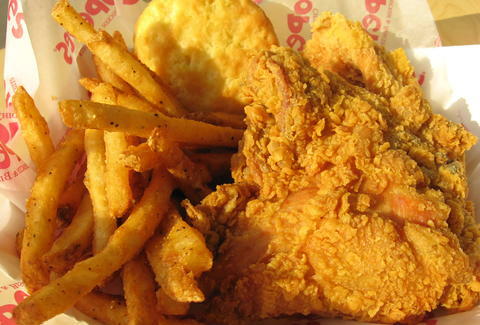 Earlier this week, a Clifton Park woman was dining with her family at a Popeyes location in Harlem when she allegedly discovered a dead rat’s head in her fried chicken. Rosemary Thomas wrote about the grisly discovery on her Facebook page (with an accompanying Pic Stitch!). In the post, she expressed particular outrage over the restaurant’s “nerve to have a 5 rating” while casually serving rat. The NYC Health Department awarded the restaurant an “A” grade in April 2016, so it's possible that's what she's referring to. According to DNAinfo, Popeyes corporate is investigating the incident. A spokesperson also noted that if you notice something gross in your order, it’s usually chicken gizzards. Which may not be much more reassuring? This isn’t the first time someone has made rat-related claims about their fast-food meal. Last year, an LA man allegedly got served a whole rat at KFC, which actually turned out to be chicken. So, is it likely that a Harlem Popeyes actually managed to fry up a rat and serve it up as an unintentional secret menu item? Probably not! But does any logical reasoning decrease our terror at the prospect that our Saturday afternoon Popeyes meal has been deep-fried rat the entire time? Nope! Seamless sushi it is!